All the data provided in Hekuma's machine specific spare parts catalogues, both drawings and parts list data, is generated directly from Inventor and then imported into PARTS-PUBLISHER's catalogue database for automatic production of the catalogues. At the touch of a button, parts lists can be extracted from the original 3D design data, exported as Excel files and then imported into the catalogue database. 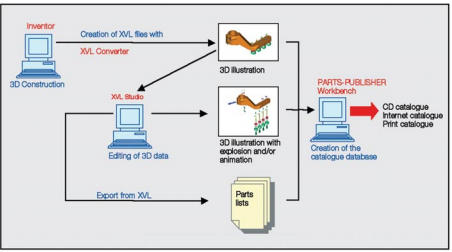 3D drawings are imported into the PARTS-PUBLISHER database in the new 3D format XVL. Fill out the form below to read the complete content.